Road movies, partly motivated by US’ sprawling highway network and neon-lit motels, and partly by the possibilities of existential meditations, formed the most definitive aspect of Wenders’ filmography. The Wrong Move was the middle chapter in his famed ‘Road Movie Trilogy’ – it was preceded by the fascinating Alice in the Cities and was followed by the powerful Kings of the Road. This made-for-TV film was also the most curious, overly philosophical and experimental of the lot (also the only one filmed in colour), even if it never reached the breathtaking beauty of the two that this was sandwiched by, thus making it the least watched of the trio. Wilhelm (Rüdiger Vogler), the depressive, uncommunicative and directionless protagonist suffering from a deep sense of existential and identity crisis, wants to be a writer, but hasn’t managed to translate his thoughts into something tangible. Realizing that he’s become akin to a frog in a well, he decides to plunge into a randomly chosen trip across West Germany in search of meaning and truth. He’s joined in his wanderings by an equally weird and drifting group of fellow travelers – Therese (Hanna Schygulla), an alluring but deeply lonely movie actress, Laertes (Hans-Christian Blech), an ageing hippie-like street musician, Mignon (Nastassja Kinski), a young and mute juggler of ambiguous sexuality, and Landau (Peter Kean), a sensitive poet of rather limited talents. The bleak tone, rambling narrative and deliberately disjointed interactions between the oddball characters, along with the underlying thematic strand of regrets, ennui, confusion and aimlessness, made this a dense, aesthetically challenging and confounding watch – striking and off-kilter in some parts while dry and self-conscious in others. Husbands and Wives, Woody’s fabulous take on his idol Bergman’s Scenes from A Marriage, might well be the last masterpiece in his prolific filmography thus far. 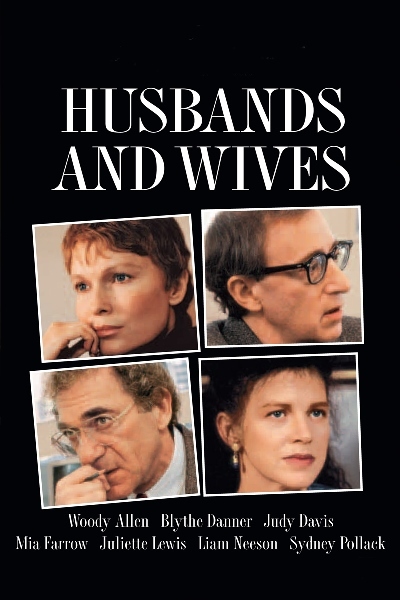 Mordantly funny, incredibly penetrating, wryly ironic, deeply perceptive, and filled with elements of docu-drama, the film provided a darkly fascinating examination on marriage, fidelity and neurosis amongst Woody’s pet demography of intellectual, urban, upper middle-class. 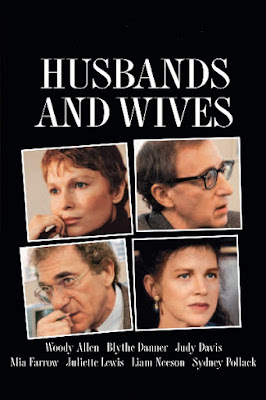 When their best friends Jack (Sydney Pollack) and his striking wife Sally (Judy Davis) casually announce during a dinner invitation that they have decided to split, the news do not just infuriate Gabe Roth (Woody) and his wife Judy (Mia Farrow), it literally rips apart the veneer of their seemingly happy married life by bringing to the surface rarely spoken discontents and dissatisfaction in their relationship. While Jack starts dating a pretty, dim-witted aerobics instructor (Lysette Anthony) and Sally plunges into a tentative affair with the dandy and younger Michael (Liam Neeson), it’s clear that neither relationships would last long. 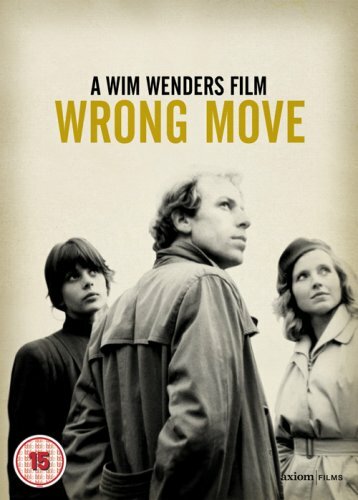 On the other hand, Gabe, a novelist who borrows freely from his own life, starts getting deeply besotted with his precocious student (Juliette Lewis) who hero-worships him, while Judy finds her infatuation towards Michael, who’s her colleague, turning into love, and one realizes that their lives have started taking divergent paths. Faux-interviews of the characters were slyly juxtaposed with the narrative, which added to the film’s brittle, pungent, self-deprecatory, bare-knuckled and at times disconcerting humour (given Woody and Mia’s scandalous break-up during the time of the film’s release) and underlying melancholia, aided in no small parts by the savage, witty and perceptive script, terrific character arcs, and fabulous performances by the ensemble cast. Note: My earlier review of the film can be found here. 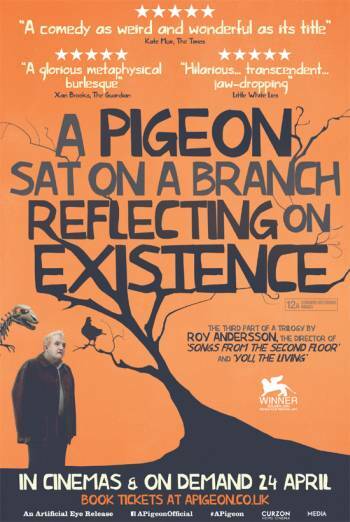 The beautifully titled A Pigeon Sat on the Branch Reflecting on Existence brought to close Roy Andersson’s droll, poignant, episodic and highly ambitious ‘Grandeur of Existence Trilogy’, which comprised of Songs from the Second Floor and You, the Living, and made 7 years apart from each other. Mordant humour, deadpan observations on the perils of modern existence, melancholic undertones, stylized production designs, static camerawork, multiple tableaus stringed around a central narrative, and meditations on such themes as mortality, unemployment, loneliness, socio-economic oppression, and so forth, imbued the trilogy with the feel of one continuous show shot as three different films. The central tale dealt with the woes, frustrations and existential crises of Sam (Nils Westblom) and Jonathan (Holger Andersson), two travelling salesmen striving in futility to sell novelty items intended to make people laugh – ironically, sight of the two glum, ageing and down-on-luck men, with no companions but each other, and living in claustrophobic apartments, was anything but smile-inducing. Various vignettes were woven around this – the bitingly funny sequence where the sons of a dying lady try to get hold of valuables clutched by her as she’s convinced she can carry them to afterlife; an enthralling and deeply tragic musical interlude where a partially crippled waitress at a bar rouses emotions among a group of young, sad-faced war drafts many years back; Charles XII, the glibly callous Swedish king, making a stop at a diner in order to make a trip to the loo; et al. Despite the been-there-seen-that feel that is bound to emanate having watched the earlier two films, on its own this once again managed in being a simultaneously playful and bleak work filled with striking visual signatures and a running sense of pathos. 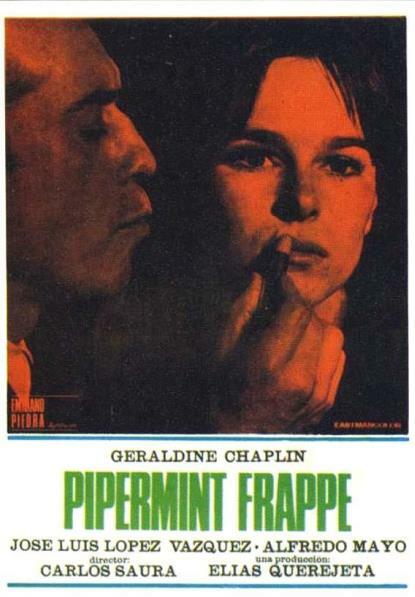 Peppermint Frappe, Saura’s first of 9 films with his muse Geraldine Chaplin and the brilliant first chapter in his Bourgeois Trilogy (which also comprised of Stress is Three and Honeycomb), was highly reminiscent of the Bunuel and Hitchcock masterpieces El and Vertigo, respectively. The film, through delightful concoction of dark, brooding character study, and an alternately playful and pungent tone, provided a striking critique on Franco-era bourgeois morality and shallowness, and a lacerating examination on obsession and repression. The seemingly discordant opening sequence, showing a pair of male hands meticulously cutting images of models from fashion magazines purportedly for his personal scrap-book, exquisitely set the thematic context for what followed. The hands, as it turned out, belong to Julián (José Luis López Vázquez), a middle-aged physician who runs a clinic with the aid of his shy, introverted assistant Ana (Chaplin). When a long-time friend (Alfredo Mayo) introduces his much younger, newly-wed wife Elena (also played by Chaplin) to him, he immediately becomes enraptured by the carefree, liberated and outgoing lady as she reawakens a memory and also titillates his suppressed desires; he starts pursuing her with increasing vigour, albeit in futility, with his brazen obsession further fuelled by her casual flirtations and deliberate teasing, and he even starts moulding Ana, through a mix of cajoling and coercion, in Elena’s image. Understandably, these increasingly sordid and desperate attempts lead the tale to a disturbing climax. Loaded with socio-politico-religious imagery and commentaries, this gleefully perverse, subversive and captivating film boasted of an arresting central performance by Vázquez and an equally fascinating dual-turn in diametrically opposite roles (a reverse of what Bunuel did in That Obscure Object of Desire) by Chaplin. 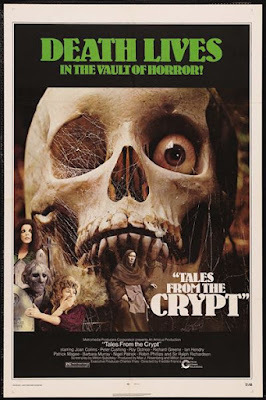 During its short lived history Amicus Productions became the only serious rival to Hammer Films in the domain of British horror B-films, and Tales from the Crypt, based on stories from the cult EC Comics, remains the most well-known among the seven portmanteau horror films that it produced, thanks in no small measures to the popular 7-season HBO TV series. Connected by a framing story about a group of 5 tourists stuck in an underground catacomb and made to face their futures by a robed man (Ralph Richardson), it comprised of 5 shorts that were deliciously misanthropic in their portrayal of the grotesque side of human nature and in their espousal of the tenet that human society is basically rotten to the core. In the gleefully bloody …And Through the House, a scheming lady (Joan Collins), after murdering her doting husband, finds herself running from a homicidal lunatic on the loose; in Reflections on Death, a businessman (Ian Hendry) coolly abandons his wife, only to be left disfigured by an accident while eloping with his mistress; in the deeply melancholic Poetic Justice, a wealthy snob (Robin Phillips) decides to get rid of his neighbor, an aged garbage man (Peter Cushing), but faces a horrible comeuppance in return; in Wish You Were Here, a rendition of the renowned W.W. Jacobs short story The Monkey’s Paw, a business man (Richard Greene) close to bankruptcy faces a horrendous future thanks to an ancient statuette; and in Blind Alleys, the residents of a home for the blinds exact a clinical revenge on their callous director (Nigel Patrick). Despite the weak framing device and a forgettable climax, the demented episodes made this a rather enjoyable ride.